DIY-3398 is another quality Adel Lock from Shieldlab, LLC. Adel is the world leader in biometric technology that pioneered fingerprint recognition development and applications. Protect Your Home or Business with This NEW Easy-to-Install Biometric Lock. Grant access to authorized users with the touch of a finger. This new DIY-3398 lock can be open by your fingerprint, password/code and a traditional mechanical key. This new door lock provides a lot of convenience to people who often forget their keys. 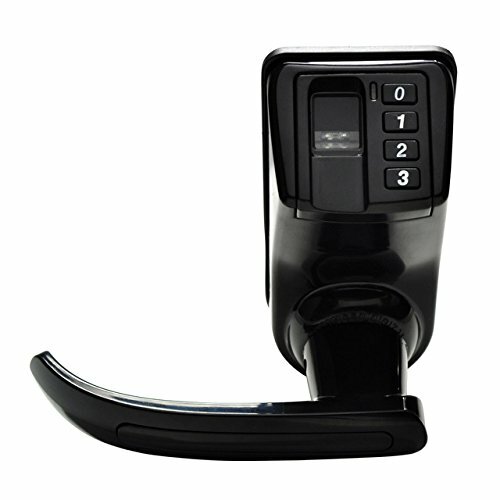 For more convenience, this lock is also equipped with password/code system. If users don’t have the required fingerprint impression, then the door can still be opened by entering the required code. Users just have to remember the correct combination of the 6-digit programming code to unlock the door. The Adel DIY-3398 interior door lock can also be opened by using a mechanical key. The surface of the Adel DIY-3398 lock is PVD coated metal body that helps to increase the overall durability of the lock. The new Adel DIY-3398 door lock can easily be installed on door thickness up to 3mm – 60mm. This lock can be a perfect choice of security for Business, school, college, university, home, bank, etc. Always locked! Love it! Works well and is sturdy and good quality. Programming is a little tricky but not too bad. It comes from factory with setting that will allow any fingerprint to operate. You have to clear programming and set it up for you. Works fine. Love that the door is always locked and don’t need a key!